Archy Stallings and Nat Jaffe own a vinyl record shop on the dilapidated Telegraph Avenue in Oakland. It makes a modest income but mainly provides a hang-out for the locals. Now Archy and Nat are worried because ex-NFL pro Gibson Goode is planning on opening a huge media outlet two blocks away that will include a department for vinyl. Archy and Nat thought that city councilman Chan Flowers was blocking the permits, but now he seems to have changed sides. Curiously, he has also begun asking Archy about the whereabouts of his father, whom Archy has not seen in years. Luther Stallings and Chan Flowers were involved in a crime years ago before Chan became respectable. Luther went on to star in several Blaxploitation karate films in the 70’s, but for years he has been a has-been and a drug addict. Now, Luther is trying to shake down Chan for the money to make a third film in his famous series. Archy isn’t altogether certain how he feels about losing his business, but he has other problems. His very pregnant wife Gwen has caught him cheating on her, and his 14-year-old son Titus from a previous relationship, ignored until now, has turned up and made friends with Nat’s son Julie. Furthermore, Gwen, who is in partnership with Nat’s wife Aviva as midwives, has lost her temper with a doctor at the only hospital that allows them admitting privileges, and a hearing is scheduled. I had a harder time getting involved in this novel than I usually do with Chabon because I found Archy’s behavior reprehensible on many fronts. Of course, Chabon sometimes seems to specialize in the adolescent behavior of grown men, but I have less patience with it. 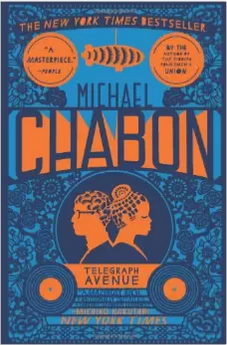 However, Chabon gets in some digs at the lifestyles of Gwen and Aviva’s white middleclass clients, which is fun, and skewers the noir genre in general with the subplot involving Chan Flowers and Luther Stallings. It takes awhile, but Archy is finally forced to consider his relationships with both his wife and his son. The energy of Chabon’s writing kept me engaged well enough, but the ending of this novel seems overly optimistic, given its web of difficulties.